To avoid contamination, most products we sell are not returnable. Federal & State Health Regulations forbid us from taking back items such as pillows, braces, supports, collars, hot packs, topicals, etc.. We do not handle products that may be a health concern due to contamination via skin, sweat, hair and saliva. Head lice, bed bugs, pet fleas, bacteria, and other contagions may be seen with use of these products, as well as with fraudulent returns and/or product tampering. Our return policy is your guarantee of a fresh, new product that may be used in comfort and safety by you and our health care professionals. Before purchasing any of our products, it is very important that you take the time to make sure that you are selecting the right style, size and type of product. We have gone to great lengths to add as many details about our products as possible to help make your decision. If you need further help, our customer service department would be happy to assist you. We do not warranty allergies and make no claim for cures or that any product will help YOUR specific condition. We recommend you seek specific advice from your health care provider. There are no returns on used or tried products, on any custom made product, or on any product that requires modification for use. Any unused return requires an authorization number issued prior to returning. Authorization of unused products needs to be within 7 days after confirmed delivery. Returns will be inspected to comply with health regulations. Returns will incur a 15% processing fee, minus our original shipping cost. Any unauthorized item will be refused/return to sender. Any item stated unused that is clearly used or tried will incur an additional 50% disposal fee. For returns, please respond to your confirmation email or include your order number/information in the contact form. Failure to do this will cause procedural delays. Customers incur any additional costs requiring manufacturer validated returns. Return of the item in acceptable condition is your responsibility. Ordering by phone does not negate this return policy. We do not have a trial period. Opened and repackaged items are considered used. If you are not sure or do not agree to this policy – you should not purchase!. Our processing fee is for time and expenses including materials and personnel incurred during shipping, handling, and processing forms. Trying to avoid our return policy is an attempt to increase the cost of our products to those who rely on our low pricing and free shipping. The return policy is linked and available on every page. Any return that is authorized and in acceptable condition for exchange will not incur a processing fee, however; return shipping is your responsibility. There are no exchanges 7 days after confirmed delivery. The quickest method is to reply to your confirmation email for a return authorization. You may use the contact form. If using the form, the transaction ID and order name should be included to avoid delay. You will need to purchase the new item. This allows free shipping in the continental US. 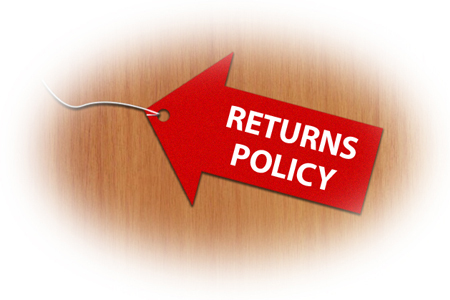 When your return is received, the item will need to be in new condition with all materials to receive a full refund. Similar to returns, items in used or damaged condition are return to sender. We reserve the right to subtract our initial shipping fee. Any item received due to our error will be replaced with the correct item and a return label or pickup provided.